On so many levels, God used you today in a big way with our staff. You bolstered everyone’s role on staff, you encouraged everyone to be alert to being used of the Holy Spirit as a witness, you gave practical help to be and do who God made us to be, and you did it all with passion, enthusiasm (which literally means ‘God in you’), scripture and a little humor! The interactive activities were great and meaningful and even at ‘fast forward speed’ we got much out of today and can see how this will rock the world of everyone at COTH. Thanks so much for sharing with us today and may God bless you richly on the trip to Idaho and back again. I know we’ll be together again on the 20th but please know I’ll be praising God for you every day until then! Please say hi to Diane for me – what a precious wife God has blessed you with. Although I’ve been a Christian for most of my life, it wasn’t until completing Ken Ramey’s evangelism class that I finally had the courage to actually pray with someone to receive Jesus as their Savior. Nancy Halford, a 92 year old acquaintance of ours, was the person that the Lord laid on my heart. We had visited her occasionally and had even prayed with her. On one particular Sunday a couple months ago, I asked her if she knew she was going to Heaven. She replied, “I hope so.” I then asked her if she would like to know for sure. When she answered, “Yes”. I then asked her to repeat the sinner’s prayer after me. I felt she was very sincere as we prayed. Immediately after praying I felt inspired to sing, “There’s a New Name Written Down in Glory.” We gave her a large print New Testament, and have followed up with several visits. A little over a year ago, my path crossed the path of Ken Ramey’s. Ken and his wife, Diane had come to McMinnville and Bethel Baptist Church to serve as Evangelism Coaches. I have to admit that I am a skeptical person when it comes to Evangelists and, as a result, I was skeptical of Ken. At first, I kept my distance and observed this man who had come into our church family. One day during the summer, I was out on my bike ride and was passing by the church. Pastor Jason was walking with Ken on the sidewalk. I pulled up alongside them and Pastor Jason introduced Ken and me and explained that they were on a “Prayer Walk” around the church property. That was the first time that Ken and I talked. Later, Ken approached me at church one Sunday before the service. He let me know that my wife and I were recommended to him as potential Evangelism Team members. With my skepticism in full swing, I attempted to keep my distance and tried to downplay the recommendation. In my mind, the last thing that I wanted to do was get “hooked” up with an Evangelist. Ken asked if we could meet sometime and discuss the possibility of joining the team. Eventually, we met and had the discussion. I tried to explain that I wasn’t interested in evangelism as much as I was with discipleship and my focus was on serving on the Men’s Steering Committee. He tried to explain that he not only wanted me to be on the team but he wanted me to be the Point Person for his team. I tried to respectfully decline. Well, over time, Ken and I had several more conversations. Needless to say, these conversations allowed me to get to know Ken, the man; not just Ken, the Evangelism Coach. 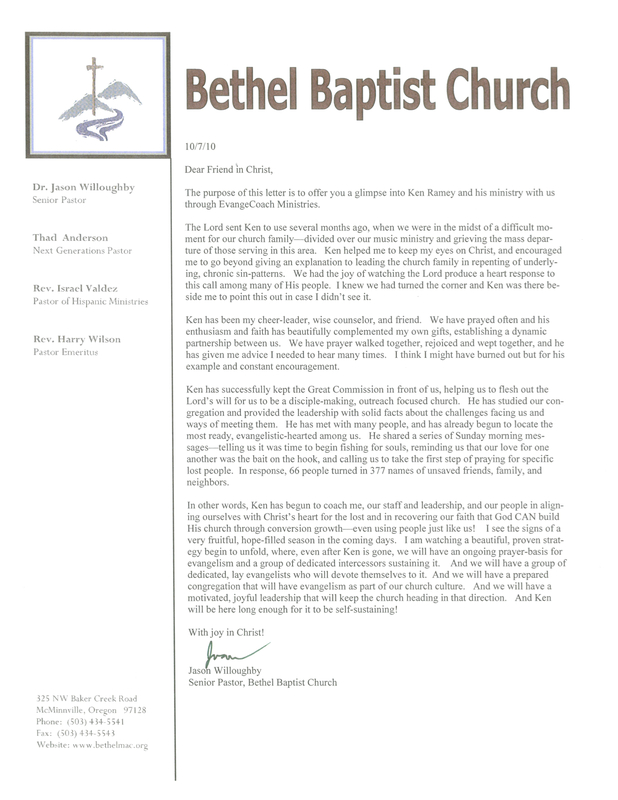 Over time, I bought into what Ken was trying to do at Bethel Baptist Church. Ironically, at about the same time, I had a couple of the high school students come to me and ask about having a Bible Study in my classroom. Over time, this Bible Study group became a certified Fellowship of Christian Athletes Huddle. This added another dimension to the relationship that Ken and I were growing. We became partners, not only with the Evangelism training at Bethel, but in the training of the student leaders of the FCA Huddle at the high school. The adult Sunday School class that my wife and I were attending was one of the first groups that went through Ken’s class called “Bringing My World To Christ”. He asked me to help with that training and present some of it in his absence a couple classes. We were also in full swing planning an event called Gym Jam that would be sponsored by the FCA Huddle group at the high school. 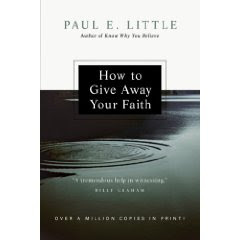 At this event, the Gospel would be presented and an invitation to respond would be given. We would need “counselors” to meet with those students who made decisions. We invited members of the Sunday School class who were going through the training to be some of the counselors. Many of them accepted the invitation and others from Bethel were recruited and Ken “coached” them to be counselors for this event. Now, I realize this is different training. The training provided to the counselors was to help them talk to a student that just responded to an invitation. The Evangelism training is about “Missional Living”, in other words, being conscious of those people in your sphere of influence and living your life for Christ in such a way that brings them one step closer to Christ. It involves praying for them, caring for them, and at some point, sharing Jesus with them. Ken attempted to continue his work at Bethel, but unfortunately, the atmosphere at Bethel was disintegrating. Without getting into specifics, Bethel was not a healthy church and despite Ken’s attempts to work with Pastor Jason and the elders, it became more and more apparent that, as odd as it sounds, Bethel was not ready to be trained in missional living. Even with that, Ken and I were able to put on a weekend training session in which about 20 people attended. Later, during the summer, Ken was invited by Pastor Fred Rigwood of the First Assembly of God to do a training session during their week-long “Camp Meeting”. Ken invited me to help with that training as well. About 25 people attended this training session throughout the week. I am now “hooked” up with an Evangelist. Ken has become not just a ministry partner, but a spiritual mentor in my life. He continually challenges the way I think and the way that I live. He continually challenges me to be the leader that God has intended me to be and to train the young men and women that I work with at the high school to be the leaders that God has intended for them to be. I thank God that Ken was led to McMinnville, Bethel Baptist Church, and me. I look forward to continuing our work together in churches in our community and with the Fellowship of Christian Athletes at McMinnville High School. In the last couple weeks, I have had the privilege of spending a bit of time with Noah. Perhaps you have, too. Certainly, you have been in contact with him by email or phone, and know that he is in the early stages of construction on his ark. You might even have seen it yourself. In fact, my hope is that you will take a moment to look more closely and know what he knows, despite what your five senses might be telling you, and that you will jump on board, so to speak, and help. It makes little sense for him to be building this ark, considering the economy, the stable job he left and the financial needs he and Mrs. Noah have, but he does not build it because he thinks God wants him to do so, he builds it because he knows God wants him to. Despite what his five senses are telling him, he is as convinced as if God had spoken to him audibly. And I believe it, as well. 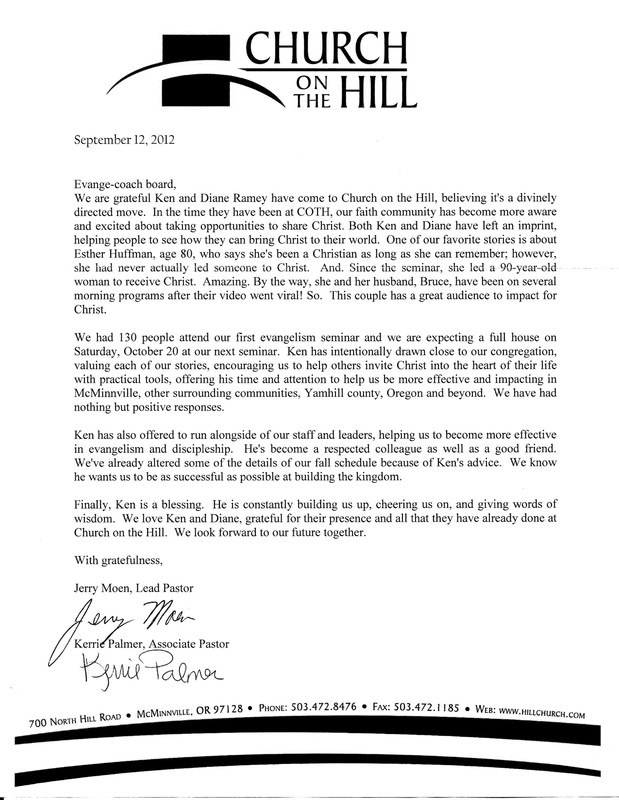 Of course, I am speaking of Ken and Diane and the new ministry God has called them to. By human standards, it may make little sense and the hardship this new direction invites is somewhat frightening, but this is the essence of faith, is it not? No doubt, you know of the basics of the Real Career and might even be convinced of its need in the life and ministry of the local church. I come at this from two different angles. On the one hand I am one of many who struggles to be an effective ambassador in the work place from day to day. On the other hand, I am the pastor of a small local church faced with the reality that I can and will never reach the people, as pastor, that I could in the secular workplace. I am convinced that, as a church, we are in great need of the Evangelist, the Lord’s gift to the church (Ephesians 4), to equip and help mobilize each of us to go out and do the work of an evangelist and to bring in those with whom we are in close contact on a regular basis. I am convinced that our church is not doing what it could to reach the lost, despite our best efforts. Why? Because I am not an Evangelist like Ken is. I am a Pastor. And while I am to “do the work of an evangelist” I am not impassioned, do not think and am not gifted like one. It’s that simple. I am thrilled with anticipation, waiting to see how the Lord will use Ken in the life and ministry of our church! Ken must build this ark. There are souls to save. Will you ask him to help? It has been a joy to know and serve with Ken and Diane Ramey. Our lives came together in the early ‘70’s as we served together at Salem Heights Baptist Church in Salem, Oregon. We became very close friends during those years. It was very obvious from the beginning here was a young man with a deep devoted love for God and people, which has lasted to this day. I believe God has taught Ken many lessons during the intervening years which has lead him to this point of launching out in a new and much needed in an ever changing culture. I would highly recommend Ken to any church that is looking for new ways of reaching the lost. His years of experience and keen insights will be a challenge to any church seeking to expand their ministry. His joyful enthusiasm will lift your spirit to new heights and your church will spiritually prosper.